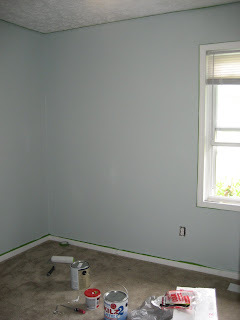 Here is the nursery paint color! The painters tape is still up and there are still some touch-ups left to be done. I just love the color though! Its a really great blue-gray and we all know that I love gray so it works out perfect! I had a doctors appointment today and I found out why I have had to give blood every (darn) time! The nurse said that it was because I have O Negative blood and that there are different antibodies in O- blood that they need to screen. She also said that I would need to get used to it (she didn't say it exactly that way) because it will be the same for every pregnancy that I have. And as for my ribs, there is nothing they can do and the doctor said that the pain would probably just keep getting worse. :( On a positive note though she also said that I probably wouldn't have to deal with the rib pain in future pregnancies, so that is good. Anyways.... I am going to enroll in a sewing class at the community college! I am so excited it is Monday nights from June 15th through August 10th. I realize that I will miss the last few classes when Kenley arrives, but I still think its going to be great! Especially because if I know how to "properly" sew, then we will really get the most out of my sewing machine! I like it! All of your accessories are going to look fabulous! !